The lovely Manor Suite apartment offers the unique experience of living in a grand old characterful country house. The first floor accommodation is light and spacious with lovely views of the garden across the front lawns. Thie self-contained apartment is approached through the impressive ground floor, gothic arch main front entrance (no steps). The arch is decorated with an interesting, wood carved dog-tooth design. The outer double doors are some 1320 mm (52") wide whilst the inner door is 1090 mm (43")wide. From the spacious entrance hall with high ceiling and unusual skylight, a wide, double-banister, dog-leg staircase with seventeen steps topped with a small balustrade, leads off to the apartment. Going through a separate lockable entrance door, the apartment is spread over the first floor level and the rooms connected by a corridor with one step along its length. The Manor Suite has period charm from the days when the rooms were used as the main bedrooms by the lady and gentleman of the manor house. It is characterised by large spacious rooms, high ceilings and wide doors. 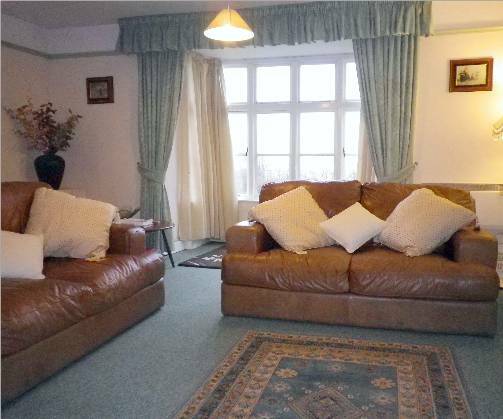 The spacious, bay-windowed sitting room is luxuriously furnished with two high quality leather three-seater settees. Also there is an attractive period sandstone open fireplace with 'real flame' gas fire, oak sideboard, stereo radio/cd player, digital TV and DVD player, night storage heater and wall mounted electrical convector. A selection of reading books, magazines and brochures of local attractions are also provided. 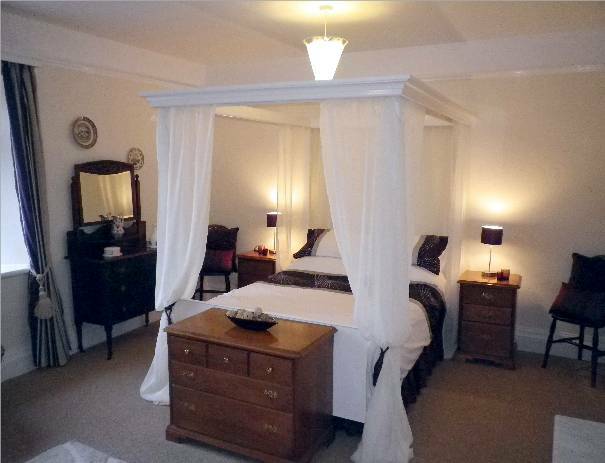 The large master bedroom has been recently refurbished in a romantic style with coordinated soft furnishings and an attractively draped four poster bed, oak dressing table, chairs, wardrobe and vanity unit. Wall mounted electrical convector heater. 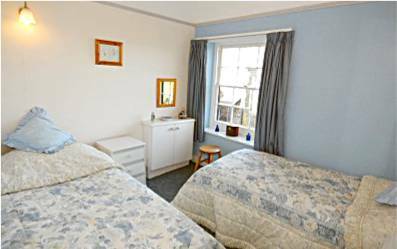 The second bedroom has twin beds, bedside tables with drawers and a wardrobe and overlooks the pretty courtyard. Wall mounted electrical convector heater. 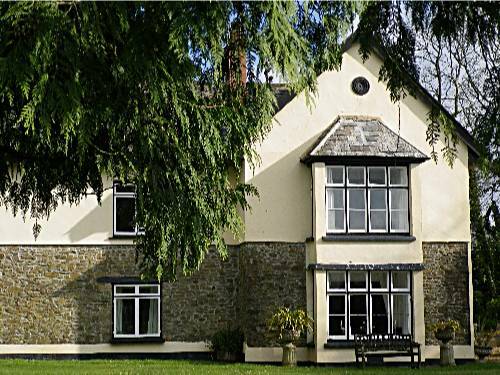 The master bedroom and sitting room face south and overlook the gardens so that you can enjoy the lovely views south across rolling fields towards distant Dartmoor and Bodmin Moor. Many guests have also enjoyed watching the rich variety of wildlife that visit the grounds. The spacious open plan kitchen and dining area is well equipped and includes dishwasher, microwave, gas cooker and refrigerator. The bathroom is fully tiled, has an over bath shower, wash-basin with vanity unit, shaver point, heated towel rail, fan heater and toilet. Hot water is provided by timed iimmersion heater with boost facility. Electricity, gas, bed linen and towels are included in our tariff. So that we can accommodate guests with pet allergies (and also due to owners' allergies), regretfully, we do not allow pets. Sleeps from two to four plus cot. Arrived after a perilous journey through ice, snow and a blizzard. But what a winter wonderland; well worth the effort. Departing today to face reality - reluctantly. Many thanks for a lovely stay in wonderful surroundings. We have enjoyed a tranquil, peaceful New Year and hope to return next year. Short breaks are available from mid-September until end of May and for late availability, dates to suit you. Our peaceful holiday properties are also popular all year round with couples celebrating special occasions with a quiet romantic break. 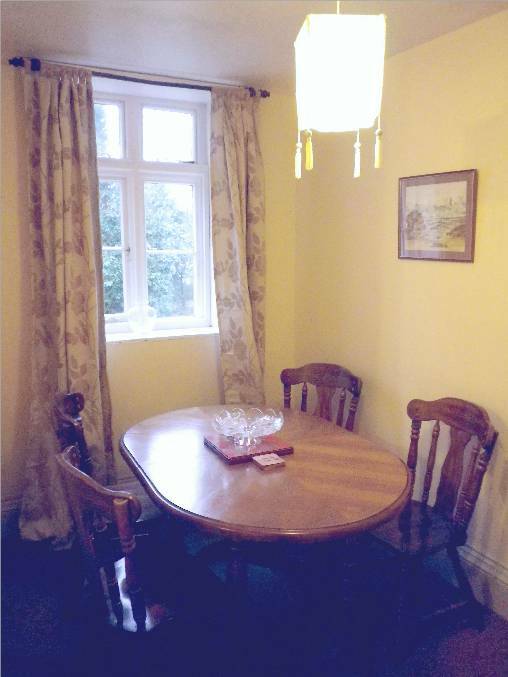 A charming stone built character cottage that sleeps from two to four adults plus cot. The Grooms Cottage has an attractive open-plan lounge, kitchen and dining area with exposed beams and homely furnishings.